What is a photovoltaic (PV) panel and how does it work? What are the main components of a PV solar home system? What are typical terms you get along? A photovoltaic panel converts the sun radiation into electricity. This is achieved through solar cells, which are put together to a solar panel. The principal of the photovoltaic panels is based on the photo effect and was already discovered 1839 by Alexander Becquerel. At this stage the leading technology on the market is silicon based, with a market share of about 80%. The second most common technology with about 10% market share is thin film based, where of CdTe is the most common technology. That's why the focus of this Website will be on the crystalline solar panels. 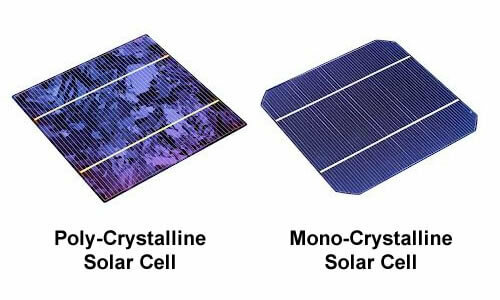 There are basically two different types, mono- and poly-crystalline. The raw material for both is silicon. A boule is a single-crystal ingot produced by synthetic means. In the semiconductor industry, boules can be made by a number of methods, whereby the Czochralski process the most common one is, which result in a cylindrical rod of material. In the Czochralski process a seed crystal is required to create a larger crystal, or ingot. This seed crystal is dipped into the pure molten silicon and slowly extracted. The molten silicon grows on the seed crystal in a crystalline fashion. 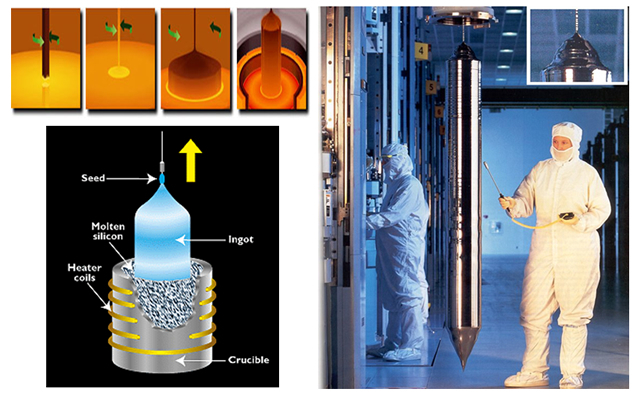 As the seed is extracted the silicon solidifies and eventually a large, cylindrical boule is produced. The efficiency of a mono-cell is about 20%. For poly-cells the raw silicon is melted and poured into a form. The advantage of this technology compared to mono crystalline, that the process is not so time and energy consuming, but the price for it is a reduction of the efficiency, which lies for poly-cells at about 16%. CIS-, CIGS Solar cells (copper-indium-gallium-diselenide). Not very common, but has for thin film a high efficiency of about 17,4%. The problem with this technology is the indium, which is expensive and limited. CdTe-cells are cheap in production but only reach an efficiency of about 10% so far. The centrepieces of a solar-panel are the solar-cells. Normally a semiconductor crystal boule is cut with a diamond saw into circular wafers. In a following process the wafers are cleaned and receive a coating, which gives the solar cells their typical appearance. The thickness of a solar cell is about 0,2mm. In the next step these cells are soldered together to a so-called string. Which again are soldered together to a so called matrix, which looks like the PV-Solar panel we know. Below you find a typical setup of a PV-Solar panel. To ensure the long life span of the solar panels (some companies offer already 30 years warranty) the solar cells must be protected from environmental influence. 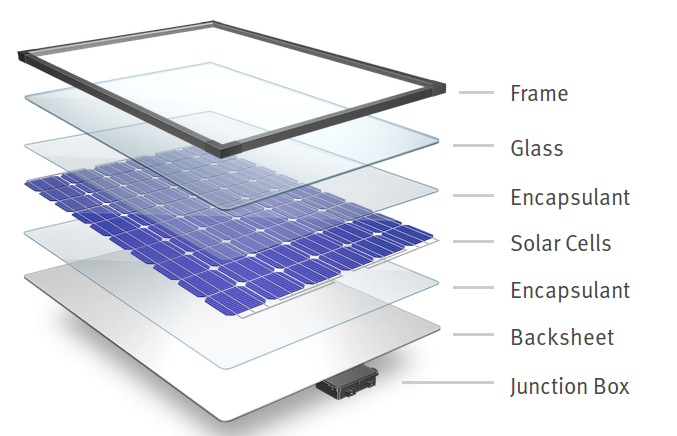 A typical PV panel has a glass sheet on the site facing to the sun and a back sheet on the rear. This back sheet is often a tedlar foil with embedded aluminium. All this components are imbedded and hold together with an encapsulate, which is often an EVA foil. 3. How does a solar cell work? Some materials are called conductors, they allow electricity to flow through them very easily (notably metals). Other materials such as plastics and wood don't really let electricity flow through them, these are called insulators. A third group is called semiconductors, they are neither conductors nor insulators and silicon, the material solar cells are made of, is such a material. They don't normally conduct electricity, but under certain circumstances, they can do so. A solar cell is a sandwich of two different layers of silicon that have been specially treated, so they will let electricity flow through them. The lower layer is treated so it is missing electrons. It's called p-type or positive-type silicon, because of the missing negative electrons. The upper layer is treated the opposite way so it has too many electrons. It's called n-type or negative-type silicon. When a layer of n-type silicon is placed on a layer of p-type silicon, a barrier is created at the junction of the two materials and no electrons can cross the barrier so no current will flow. But if a light shines onto the sandwich, the light particles (called photons) give up their energy to the atoms in the silicon. The incoming energy knocks electrons out of the lower, p-type layer so they jump across the barrier to the n-type layer above and flow out around the circuit. The more light shines, the more electrons jump up and the more current flows. Depending on the type of system certain components are required to operate the PV solar home system. On this page some of the required main components are explained and points you should consider when purchasing the equipment. As already described, there are many different types and sizes of photovoltaic panels, whereby the most common ones are the crystalline PV panels and there the one with 60 solar cells, which has the size of about 1650mm x 990mm and a weight of about 20Kg. In this chapter we will look a bit closer where the advantages of the different panels are and what to look at when you buy PV panels. Both technologies are now for many years on the market and have their advantages. Within this technology groups there are also different types, which have slightly different abilities. But they all have some facts in common. The thin film solar panels have a better diffuse and low light behaviour, which means that they are more efficient in harvesting the sun radiation in the morning and evening hours than a crystalline PV panel. The same counts for installations facing east or west, that's when the amounts of diffuse sun radiation will be higher. They also have a better temperature coefficient. A solar panel produces less power when its temperature rises, with each degree the power output drops. 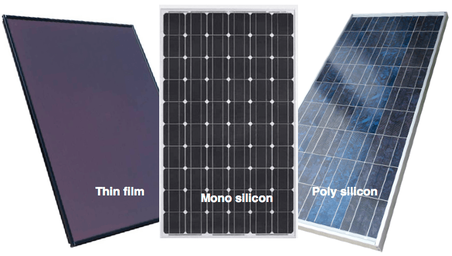 For a crystalline PV panel it's about 0.4-0.44 %/K and a thin film PV panel about 0.25 %/K. Summarizing you can say that thin film PV panels are compared to crystalline PV panels less efficient, have a lower live expectancy and are more affected by environmental effects. Their advantages are the more flexible application possibilities due to the better low light behaviour. It mostly depends on the installation and the requirements which panel to use and one typical installation type for thin film panels are huge PV parks, where space is not the main issue. As described in section 1.1 first you should think of, which type of panel suits my needs most. In most cases for instants house owners or small businesses the crystalline is the most suitable technology and at the same time also the most common one. There are worldwide plenty manufacturers of those panels and you should take a view minutes to think of what you are buying, because these panels come with a very long warranty of up to 25 years and you don't want to find out in 3 years time that your panel doesn't work anymore and you have to replace it, which can take sometimes a long time or even worse that the manufacturer of those panels doesn't exist anymore. PV panels normally come with a very long warranty. The product warranty of some manufacturer is up to 12 years and the performance warranty 80% for 30 years. That means the manufacturer is guarantying that his product produces after 30 years still 80% of its previous rated power. A common product warranty is at the moment between 5 and 10 years and the performance guaranty of 80% for 20 years. Do you want to support a local manufacturer and economy? There is a slow growing business for manufacturing of PV solar panels in South Africa, which provides certified products to the local market. But most and also the biggest manufacturer are situated in China and export their products to the rest of the world. When you consider of buying one of those products you should also inform yourself if that company is one of the established ones and how many years of experience does that company already has in the manufacturing process of PV solar panels. Because you get also a lot fly by night companies, which already close down after a view years and what happens to your guaranty after that? Regarding the guaranty it is also important to know how it is handled. Does that company have a branch in South Africa or a distributer who is handling it? Or do you have to claim it yourself in China? In areas with heavy winds the PV panels are exposed heavy mechanical loads, which can cause damage to the PV panel. So the size and there with the stability of the frame plays an important role. Most manufacturers designing the frame smaller to save aluminium and there with save production costs. As already mentioned the experience of the manufacturer is very important, how long does the manufacturer already exist? Is this a new product of that manufacturer? Are there any negative or positive reports or news about the manufacturer like recall incidents or warranty claims and how were they handled? Are there any references with this PV panels from the installer or in South Africa? An inverter basically transforms the DC Voltage from the PV panels into AC voltage, which than can be used in your household. Depending on your type and size of installation there are different types of inverters. This type of inverter transforms DC voltage, which is produced from the PV panels into the AC voltage and frequency from the local electricity network. This electricity can then be used in your own house hold and excess electricity feed into the local electricity grid. Note, before you connect or feed back into the local grid you or your installer must talk to your municipality. To be able to be credited for the excess energy there must be a special meter installed, which can count the electricity consumption both ways. For more details on the regulations from the Electricity & Energy dep. in NMB please visit following link. This type of inverter got already an integrated MPPT to optimize the performance of the PV solar panels all time. This type of inverter stop operating during load shedding to avoid electricity feed in to the grid, while it is switched off. As the name already says, this inverter works both ways. On one hand it inverts the DC voltage from your batteries into the set AC voltage and frequency from your grid supply (230V 50Hz). On the other hand it got a build in charger, which converts your AC into the DC voltage of your batteries. Some bi-directional inverters also have built in MPP trackers that allow the direct connection of PV solar panels to the Bi-directional inverter. Otherwise a separate MPPT is required to charge the batteries. This kind of inverter can be used with a battery bank and without PV panels to avoid load shedding. For more details please see also What type of system do I need? They combine the functions of the other two inverters. This type of inverter got a built in MPPT to optimize the output of your PV panels at all times and can charge your batteries as well as supply your house with the required power or feed excess energy into the grid. In cases of a grid failure it switches automatically to your battery backup like an ups. A hybrid inverter operates also during load shedding, due to internal switches that avoid a feed into the municipal grid. That means if there is load shedding during the day your PV panels still produce electricity, which can be used in your household or to charge your battery backup. The inverter can be considered as the heart of a solar system and plays a very important role in the performance of your system. The build in MPP tracker in an inverter have different operating voltages, which have to be considered when designing you solar home system also the amount of MPP trackers differs from brand and size of the inverter. The following points should give you just a guideline on what to look at when you buy an inverter but the actual design and layout of the solar system should be done by a professional. Do you want to support the local manufacturer and economy? There are some local companies producing here in South Africa. The advantage can be a fast response or replacement when a failure accurse. Usual warranties for inverters are between 3-5 years. Regarding the warranty it is also important to know how it is handled. Does that company have a branch in South Africa or a distributer who is handling it? Or do you have to claim it yourself from the manufacturer in the country of origin? What are the response times for an exchange or repair of the inverter? The efficiency is very important for an inverter and most of them have even three different ones: peak efficiency, Euro efficiency and CEC efficiency. Which one is most important when considering which inverter to buy? Many people look only at peak efficiency, but the truth is that this number does not reveal the actual performance of the inverter, because this efficiency is measured at one point when the inverter is performing at its best. But your inverter may only operate for a short time of the day at its peak efficiency. The Euro/EU efficiency and CEC inverter efficiency are ‘weighted’ efficiencies. These figures measure inverter performance across the range of the inverter’s capacity. This gives you a better idea about the inverter’s operating profile over the course of the day. A MPPT ensures that your solar panel works always at its best operation point. These MPPTs are normally already built into the inverters and one has only match the voltage range of the MPPT with the voltage of the PV array. But for example in cases where the PV panels should charge the battery directly they can make a huge difference to other charge controller like PWM. A MPPT is able to track the input power from the solar panel and the voltage from your battery bank and then re-adjust the voltage for the highest amp output to charge the battery. It is also capable of taking a higher voltage and down converting it to a lower voltage. For example a 24 volt solar panel and a 12 volt battery. When your solar panel has an output of 24 volts and 5 amps and your battery is at 12 volts the MPPT will down convert the voltage from 24 volts to 12 volts. So you will charge your battery with 12 volts and 10 amps. A standard PWM charge controller without MPPT makes no adjustments in the voltage. If your battery bank is at 12 volts and your panel is putting out 24 volts at 5 amps the PWM charge controller will allow the battery to pull the panel down to the 12 volts, while your amps stay the same. There is no down converting! This technology is used in most charge controllers and helps the battery to reach full charge by pulse charging. For those who are interested in installing a battery backup or to be off grid there is the question what type of battery should I use? There are many different types of batteries available and one must think carefully which one to choose, because it really depends on your system and purpose what type of battery to use. For a small PV system backup the battery types AGM or GEL would be a good choice. The dimensioning of the battery is very important for the life expectancy of the system. A battery is rated in Amp-hours and the capacity of it depends also on how fast the energy is withdrawn. A battery rated C20=100Ah has 100Ah when the energy is withdrawn in 20 hours. If I know want to withdraw the energy faster, let's say in 5 hours the capacity drops down to about 86Ah. So the capacity depends also on how fast I withdraw the energy. If you discharge the battery to 100% it will last only about 500 cycles. 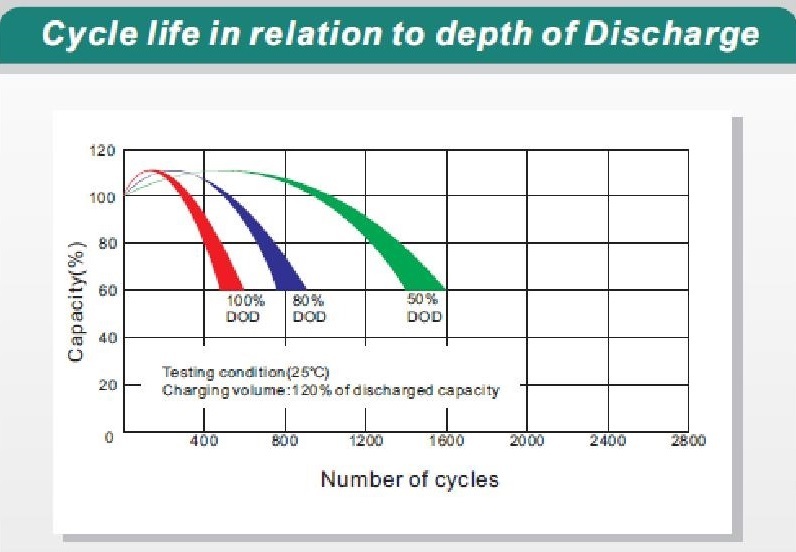 But if you discharge this battery only to 50% of its capacity it will last 1500 cycles. When it comes to the cycle life manufacturer like to use the standard that suits their batteries best or even use their own standards. But for batteries which are used for a PV system there are specific testing conditions, the EN 61427 and a battery is ideal tested under this conditions. Ideal is a pitch of about 35°. But depending on your roof it is not always possible or worth the effort to install the panels in the ideal angle. The common way of installation is to fit it on the roof with the same angle as the roof itself. To get an idea of the losses due to different pitches, the decrease in the output of the panels will be about 2.5% when they are installed with a pitch of 20° instead of 35°. But the pitch can also depend on your needs, as a lower pitch gives you a higher performance during the summer month and a higher pitch a better performance during the winter month. PV panels heat up during operation an can reach easy 60°C and a higher temperature means less performance. To allow a air ventilation underneath the PV panel it should always be installed with a distance to the roof ideal would be a distance of min. 10cm. It is important to ensure there are no obstructions that will block the sunlight from reaching the Solar PV array. A small amount of shading can reduce the performance of the whole system, not just that of an individual shaded module. Shading can occur from obstructions like neighbouring buildings, trees and even distant tall buildings can shade the system or from temporary shading such as leaves, bird droppings and other types of soiling. Dust and soot falling in industrial areas or are also significant. The effect will be less if the Solar PV got a minimum angle of about 12 degrees, so the rain can wash parts of the dirt of. The Hot-Spot-Effect describes the overheating of an area in a solar panel due to unequal light radiation and occurs when there are single solar cells in a string shaded. The shaded solar cell itself doesn't produce electricity anymore and instead act as an electrical resistance, while the other in series connected solar cells still produce their electricity. If the operating voltage of the overall in series connected cells approaches the short-circuit voltage of the shaded cell, electricity will flow, but the overall voltage becomes limited by the shaded cell. The extra voltage produced by the other cells gets converted into head at the shaded cell. The enormous power dissipation occurring in a small area results in local overheating, or "hot-spots", which can lead to destructive effects, such as cell cracking, melting of solder or degradation of the solar cell. To prevent solar panels from getting destroyed by this effects manufacturers install Bypass-diodes anti-parallel in each junction box of a solar panel. This still doesn't help to prevent this effect caused by shading to take place, but the diode bypasses the shaded string so the solar panel doesn't get any irreversible damage. In most cases the solar panel will not have 25° C and this doesn't only depend on the ambient temperature. As soon as the panel produces electricity there will be also heat generated. That means the panel temperature can easy reach 50° C, while the ambient temperature is only 20° C and with rising temperature the performance of the solar panel drops. One also has to consider that 1.000 W/m2 are not always reached. In the morning, evenings or on cloudy days it will be less and so the performance of the solar panel. On the other hand on a sunny day the sun radiation will be higher and so the performance of the solar panel.